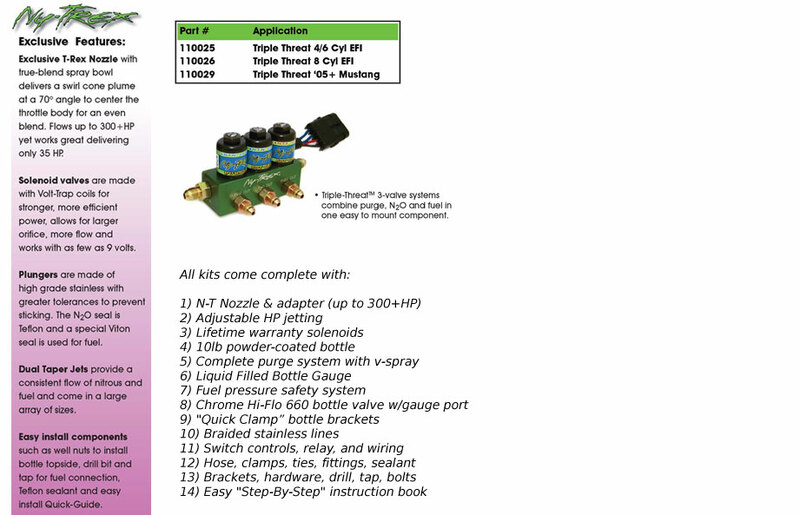 Ny-Trex is proud to introduce the next phase of nitrous innovation, the Triple-ThreatTM wet nitrous system. This system combines all three valve functions: Purge, N20 and Fuel in one easy to install component. The Triple-ThreatTM is a precision machined billet body with three integral solenoid valves with Volt-Trap coils for a dependable, clean, all-in-one nitrous system. Ny-Trex nitrous systems use only the highest quality materials and components to produce the best looking, best performing and most reliable wet system around. Ny-Trex exclusive Triple-ThreatTM systems have been thoroughly dyno-tested on numerous vehicles to ensure the most safe and reliable performance possible. Ny-Trex exclusive Triple-Threat™ nitrous systems have been thoroughly dyno-tested on numerous vehicles to ensure the most safe and reliable performance possible.